First, preheat your oven & make your brownie recipe according to their directions. In a second bowl blend your cream cheese & pumpkin until smooth. Then blend in the sugar, vanilla, egg, cinnamon, nutmeg, & flour. In an oil sprayed glass pan (pan size according to your brownie recipe description) pour a little over 3/4ths of the brownie batter & spread evenly. Then add a smooth layer of the pumpkin cream cheese mixture on top of the brownie batter. Drop little spoonfuls of the rest of the brownie mix on top of the pumpkin cream cheese layer & drag a butter knife or toothpick through the batter to create pretty swirl designs. 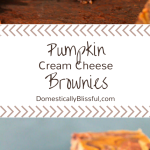 Bake your Pumpkin Cream Cheese Brownies according to the brownie directions (*1) or until the brownie has set or a toothpick comes out clean. *1. My brownies took about an hour to bake. *2. If you want clean cuts chill your Pumpkin Cream Cheese Brownies first in your fridge or freezer before cutting. *3. The brownies will become too moist if left in a sealed container.